Roughly between W 9th & 12th Sts. & the Alleys behind Louisiana & Kentucky Sts. 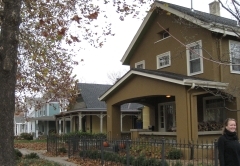 Located directly west of the downtown commercial area and east of the University of Kansas campus, the majority of the Oread Historic District falls within the Original town plat, and thus represents one of Lawrence's oldest residential neighborhoods. Not only did it provide easy access to downtown and campus, several churches were either adjacent or located within its boundaries. Central School and later a high school were located on the two south corners of Kentucky and 9th streets. 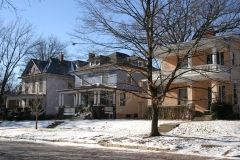 The district contains a variety of residences that represent changing tastes, fashions, and construction methods in American architecture. 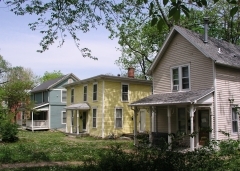 There are good examples of the large fashionable homes, several more modest National Folk type residences of the working class, and later examples of residential styles that were popular in the early twentieth century. Palmyra Masonic Lodge was one of the first Masonic Lodges in Kansas Territory, holding its first meetings in 1856 in the "open air. 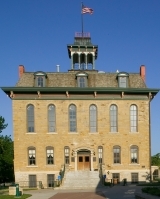 "It was granted a charter in 1859, and, until the late 1860s, the lodge met on the third floor of Baker University's "College Building" (now known as Old Castle). The Masons then partnered with the local Odd Fellows organization to build a frame building that they leased to other organizations for meeting space. A fire destroyed the building in 1891, and it took the nearly three years to rebuild. The new Italianate building was dedicated on June 26, 1894. Like other fraternal buildings of that era, the first floor was designed to lease to local businesses. The second floor was divided into two principal spaces, a lodge room on the south end and a dining room on the north. 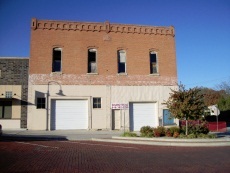 Since the 1960s, the building has primarily been used for storage. The building was nominated for its social and commercial history. 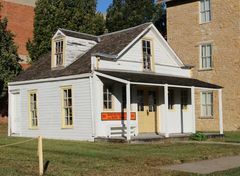 Built in 1857, the old Palmyra Post Office is the only extant resource associated with the short-lived town of Palmyra. 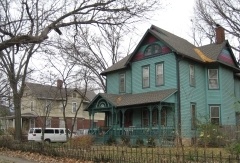 From June 1857 to May 1862, this building functioned as a post office along the Santa Fe Trail. The building was relocated at least three times since the early 1900s, finally settling into its current location in the 1980s. 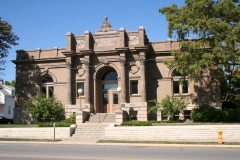 Although its relocation precludes its listing in the National Register, this building is important to the early history of Douglas County as a remaining resource from Palmyra and the Santa Fe Trail. roughly bounded by W. 5th St., Tennessee St., W. 6th St., with 501-533 Louisiana St. and 444-445 W. 5th St.
roughly bounded by W. 3rd St., Louisiana St., W. 4th St. and Mississippi St. Built in 1870, the Plymouth Congregational Church was designed by prominent Kansas architect John G. Haskell, who is known for his contributions to the design of the Kansas Statehouse and area schools, churches, courthouses, and commercial buildings. The congregation dates back to Lawrence’s earliest pre-Civil War days. The first church service was held on October 1, 1854, in a mud brick boarding house, just weeks after the first groups of New England settlers arrived. 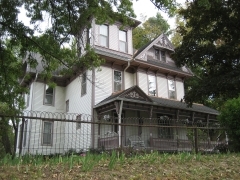 Work began on this building in 1868 and was completed in May of 1870. Church services have occurred in this building continuously since 1870. 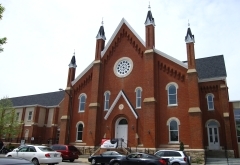 It is nominated for its architectural significance as an eclectic Victorian-era church building with Gothic and Romanesque Revival characteristics.